In this tutorial, we'll look at the Healing Brush, by far the best photo retouching tool in all of Photoshop, and how we can use it to easily reduce distracting skin wrinkles in an image. Notice how I said "reduce", not "remove" wrinkles. One of the most common retouching mistakes is to completely remove the wrinkles from a person's face, smoothing the skin out so completely that a person in their 40's, 50's, 60's or later looks like they've barely aged a day since they were a teenager. That may sound flattering, and if you're doing work for a high end fashion magazine, it may well be the result you want. But for those of us who live in reality, wrinkles are a natural sign of aging, life experience and the wisdom that comes with it, not something to be shunned and removed through heavy-handed use of Photoshop. As the saying goes, just because you can doesn't mean you should. Still, wrinkles that appear too dark and noticeable, whether from bad lighting or just lack of sleep, can detract from an otherwise great portrait, so in this tutorial, we'll learn how to reduce their impact through a combination of the Healing Brush and layer opacity. I'll be using Photoshop CS5 here, but any recent version of Photoshop will work. Removing the wrinkles on the man's face would be wrong, but reducing them would improve the image. Click on the New Layer icon while holding down the Alt (Win) / Option (Mac) key. The New Layer dialog box lets us set several options for the layer, but here, all we're interested in is naming it. Naming layers helps keep our retouching work organized and manageable. Click and hold on the Spot Healing Brush, then select the Healing Brush from the fly-out menu. Step 3: Change The Sample Mode To "All Layers" And Uncheck "Aligned"
Much like the Spot Healing Brush, the Healing Brush is basically a texture replacement tool, replacing damaged or unwanted texture from a problem area in the photo with good texture from another area, blending the good texture in with the problem area's original color and brightness values to create a seamless fix. This is what Adobe means by the term "healing". With the Healing Brush, we first select the area we want to sample good texture from by clicking on it, then we paint over the problem area to heal it with the good texture. Change the Sample Mode option from 'Current Layer' to 'All Layers'. As I mentioned, using the Healing Brush is a two-step process. First, we click on an area in the image that contains good texture to sample it, then we paint over the problem area to replace the unwanted texture with the good texture. One important thing to keep in mind when reducing wrinkles is that skin texture appears different in different areas of a person's face. 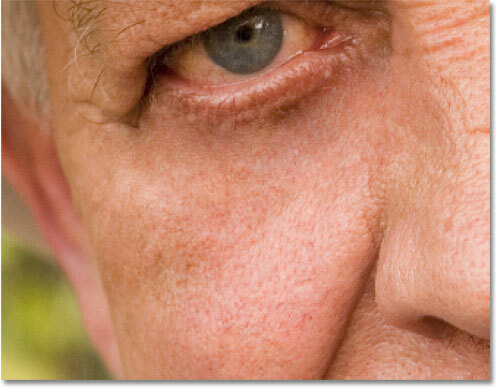 For example, the skin around your eyes has a different texture than the skin on your cheeks or your forehead. So if you want your retouching work to look as realistic as possible, try to sample good texture from an area close to the wrinkle to keep the skin texture consistent. Also, as a person ages, wrinkles become longer and deeper, so we can often make someone look younger just by shortening the length of the wrinkle. For that reason, always start at the thin, narrow end of the wrinkle, which is the youngest part, and work your way towards its origin. Hold down Alt (Win) / Option (Mac) and click on an area of good texture close to the wrinkle to sample it. Once you've sampled your good texture, release your Alt (Win) / Option (Mac) key, then move the Healing Brush over the youngest end of the wrinkle. For best results, use a brush size just slightly larger than the wrinkle itself. You can quickly adjust the size of the brush from the keyboard. Press the left bracket key ( [ ) to make the brush smaller or the right bracket key ( ] ) to make it larger. Then click on the wrinkle and, with your mouse button still held down, drag the cursor along its shape towards its origin as if you're painting over it. 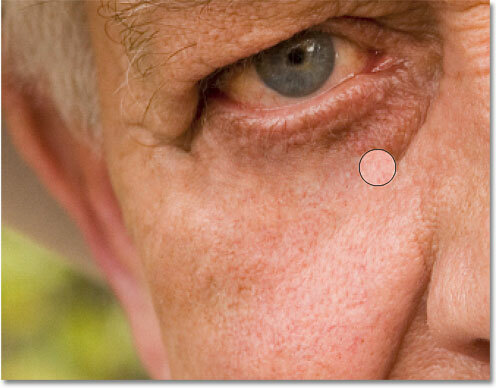 Photoshop blends the color and brightness values to create a seamless "heal" when you release your mouse button. To avoid painting with the exact same texture over and over again and ending up with a wallpaper effect, choose different areas to sample texture from as you make your way from one wrinkle to the next by holding down Alt (Win ) / Option (Mac) and clicking on a different area before painting. Depending on the length of the wrinkle and the amount of good texture available, you may not be able to cover the entire wrinkle with one continuous paint stroke, especially if the person has lots of wrinkles. 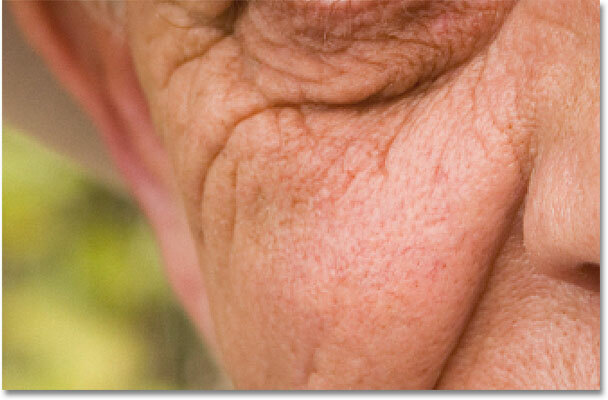 In those cases, use a series of shorter strokes, always starting from the youngest end of the wrinkle and working towards its origin. If you make a mistake, press Ctrl+Z (Win) / Command+Z (Mac) to undo the brush stroke, then try again. Using a series of shorter paint strokes to remove the larger wrinkle. The large wrinkle has been completely removed. 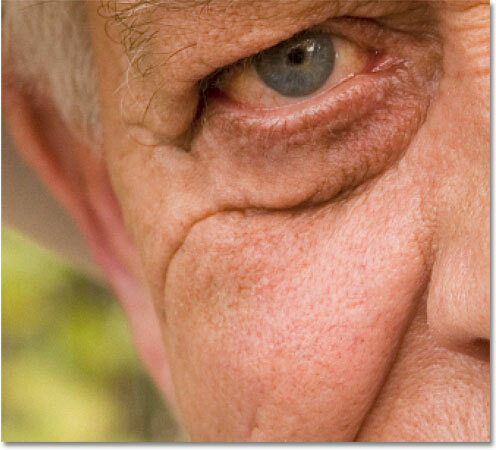 I'll continue making my way around the image with the Healing Brush to remove the remaining wrinkles, including the similar large wrinkle under his other eye. To speed things up for myself, I'll switch over to my pen tablet (a Wacom Intuos4), which allows me to change the size of the brush dynamically as I paint simply by varying the amount of pressure I apply to the tablet with the pen, a much faster way to work rather than constantly resizing the brush from the keyboard. If you don't have a pressure sensitive pen tablet, you can still get great results using a mouse. The pen just makes things easier. 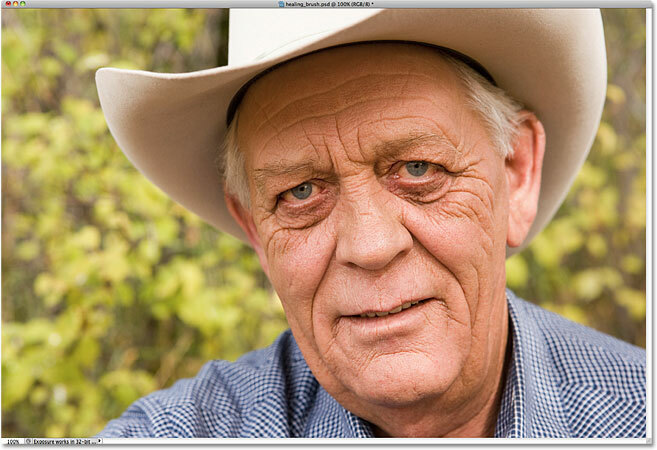 With all of his wrinkles removed, he almost looks like a different person, or at least a much younger person. The Healing Brush, along with a little patience on my part, did an amazing job of removing the man's wrinkles, but if I was to show him my results at this point, I'm not sure he'd be as impressed with me as I am. He knows, and everyone who knows him knows, that he has very distinct wrinkles on his face, and those wrinkles add a lot to his personality. You may be surprised at how many people would be insulted to suddenly see them gone, which is why our ultimate goal was not to completely remove the wrinkles, just to reduce their impact. Press "V" to switch to the Move Tool, then easily change the layer opacity by typing a number. And there we have it! That's how to reduce the appearance of wrinkles using the Healing Brush in Photoshop! Check out our Photo Retouching section for more Photoshop image editing tutorials!